I have always been partial to a fruity print. I love bright colours, (my wardrobe looks like an explosion in a crayon factory), and I love anything kitsch or cute so I think that's why I can't really pass up anything with a fruity theme. I love Etsy because you can make treasuries to suit a theme and it appeals so much to my list-making, organise everything into categories, virgo brain. 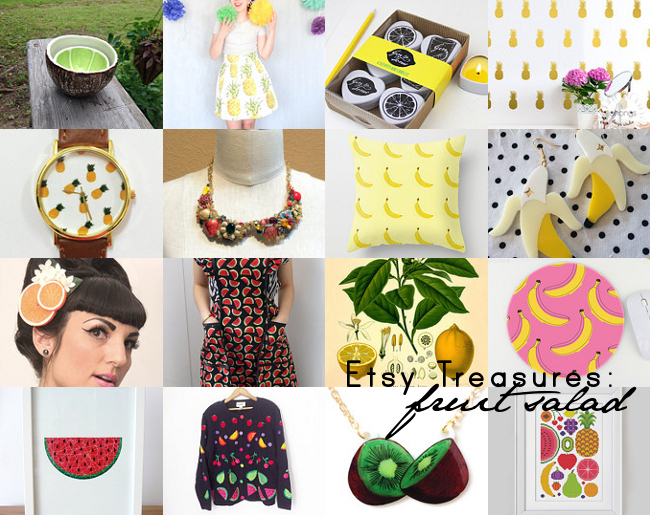 I also love how you can search for something as innocuous as 'fruit' and get so many brilliant, hand made & vintage things. I had loads of fun putting this treasury together- it can be a little addictive! 1.Lime & Coconut Bowl Pair £23.85: This is one of my favourite Etsy shops 'Vegetabowls'. You guessed it- bowls and pottery in that shapes of fruit and veg. They have some great mugs too! But I love this 'lime in the coconut' set the best. 3.Gin & Tonic scented candles: This combines all my favourite things: Gin, lemon scented candles, cute illustrations and mini things! 4. Gold Pineapple Wall Decals £14.24 If you wouldn't want a wall covered in golden pineapples then I don't even want to know you. 5. Pineapple Watch £7.95 What time is it? I don't know because there are no numbers on this watch but look how cute the pineapples are. 6. Vintage Jewellery Fruit Collar Necklace £58.96: I think this is my favourite item on the treasury. I just love how this looks with all the fragments of jewellery assembled together to create something so beautiful. I really like this whole shop- the statement necklaces are amazing. 7. Banana Pillow £21.20 I love yellow and I try and get it into my home furnishings as much as possible so this cushion is PERF. 8. B-A-N-A-N-A-S! Acrylic Earrings £11.93: Gwen would be proud tbh. This whole Etsy shop is amazing too and really affordable. 9. Orange Blossom Fascinator £13.25: Fascinators have kind of become a bit 'mother of the bride' these days but I think this one is so cute and summery. It comes in lemon and lime too! 10. Watermelon Print Apron £25: I love the big pockets in this apron! I wear an apron pretty often, both at work & at home so this would make wearing me feel a bit fancier wearing it. 11.Botanical Lemon Artwork £6.63: I love these kinds of botanical vintage drawings, and I am particularly partial to a lemon. I think there's something really pleasing about how citrus fruit looks. 12. Banana Mouse Pad £7.95 I don't even have a mouse and I want this mouse pad. 13. Watermelon Slice Artwork £7.99 Watermelons look great too.I always love the contrast between red and green and those little black pips. Plus they are pretty much essential summer food. 14. Vintage Fruit Cardigan £22.53 I want this cardigan so badly. Applique fruit cardigans are the kinds of things dreams are made of. 15. Kiwi Fruit Necklace £15 This Etsy seller hand draws her designs onto shrink wrap so no two are the same. It gives them a really unique look too! 16. Summer Fruits Cross Stitch Pattern £6.95 If you are into cross stitch like me you can stitch yourself a fruity masterpiece. This design looks fairly simple too so any skill level could have a go! The only thing is now I have to use all of my willpower to not buy all of it PLUS I have a real craving for watermelon! I have been wanting to go to Lane 7 ever since I first heard about it. It's a retro-styled bowling alley & restaurant which honestly sounded like the best thing ever. Sometimes it's nice to do something a little different on a night out and Lane 7 seemed to be just that. So last week a few of us from work decided to check it out and so we went there for a 'work social' as we are now calling them! I thought it was great- I really want to go back again and try the food too! We just went for games and pints but they have an American Diner inspired menu that looks really good. Price wise it's kind of what you'd expect, not as cheap as a regular bowling alley (you book the lane and then it's £6 per person per game on an off peak night which I think is fairly expensive) but cheap enough that you can still have a good night out on a budget (which we were all on as it was the week before payday!) They also have other things to do like pool, ping pong, beer pong & karaoke- definitely want to try some of those! Although we played two games of bowling and I lost BOTH times so maybe I should practice that a bit before I move onto something more difficult hmmm. Drinks were fairly priced as well, it's always nice to go somewhere and be able to get a pint of beer for less than £4 these days! I've also heard really good things about their alcoholic milkshakes- definitely want to go back and try one of those! Generally I think Lane 7 is a little treasure in Newcastle, there's nothing else in town like it and it's a great night out that won't break the bank. The atmosphere is great- there's loads of fun to be had and the staff are really friendly and helpful. I definitely would go back and I'd happily recommending it to anyone looking for a good night out. (Also, am I alone in thinking that actually, the shoes look kind of cool? Er maybe I should keep that one to myself). #CoffeewithCurrys - Cocktails & Coffee & Bloggers! Oh my! The lovely, lovely folks at Joe Blogs emailed me a few weeks ago to ask if I'd like to attend a coffee cocktail masterclass evening hosted by Currys. As someone who views coffee and alcohol as two major food groups I could not reply yes fast enough! I've always wanted to go to a cocktail masterclass so I was super excited. 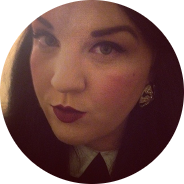 I also really couldn't wait to hang out with the lovely NEblogger lot too- a huge part of my reason for wanting to get more involved in blogging is the social aspect & the prospect of meeting new people with similar interests to mine. So on Friday at 7PM (after a small disaster where I forget my phone in my house and had to go back for it), I arrived at Revolution in Newcastle city centre to attend the masterclass. Chances are you're familiar with Revolution- there's probably one in your city! The Revolution in Newcastle upon Tyne is inside an old bank and it's really pretty with ornate ceilings and huge columns. It's got a nice chilled out atmosphere and the staff are really friendly. I hadn't been in in years and had forgotten how nice it was- it's definitely made me want to go again. We were all served a delicious coffee cocktail upon arrival, I'm not sure what it was but it was totally unreal. Natalie confessed she wasn't ordinarily one for coffee cocktails but that she was pleasantly surprised by how good it was- I think a few other girls felt the same way too! L-R Natalie (NatalieDiver.com), me & Rachael (GirlAboutTyne.com) enjoying our coffee cocktails! The lovely lot from Joe Blogs welcomed us to the event and talked us through what we'd be doing- they also revealed that the two best tweeters would win a top of the range coffee machine each! After we had all inhaled delicately sipped our cocktails we were led over to the bar area where we were taken in groups of 4 to create our own cocktails! As the evening was coffee themed we would each be making a different coffee based cocktail. The one we made was called the 'Honey Fee'. It was rather exciting being behind the bar if I'm honest. I kind of felt like a bit of a rebel being somewhere I wasn't supposed to be! The Honey Fee cocktail was made in a regular glass tumbler packed with ice which we would use with a silver shaker but any kind of cocktail shaker would do- we used 2 shots of honey whiskey (I obviously would have preferred Bushmills Irish Honey and repped for home but I'll take what I can get), 1 shot of gomme syrup (simple syrup would probably do the same job if you don't have that), 1 shot of freshly brewed coffee & 2 shots of cream. We then shook our cocktails (my fave part) until they were ice cold, and poured them into ice filled mason jars and topped with whip cream. Very indulgent! They were obviously very delicious, how would they not be with all that sugar and cream! I would definitely try making it at home- although I might just leave out the cream because I kinda felt a bit sluggish and sickly from all the dairy. The final showstopper in the masterclass was when the final group were pouring their cocktails- the bartender showed the girls how to pour three cocktails at once! It looked so tricky & I would definitely have spilled it everywhere but Rachael pulled it off like a total pro! Rachel (CaseysCloset.co.uk) pulling out all the stops and pouring 3 cocktails at once! Then the guys set up a huge shot train (which I am so hip & cool I had never heard of that word before) of rainbow coloured shots with different flavoured vodkas and set it off- very cool! You can watch it here on instagram. After our cocktail class was over the food arrived and we all decended like locusts on the pizza, cute little paper cones of chips, posh fish fingers and spiced chicken skewers. The winners of the prizes were announced and Lucy and Rachael were the very deserving winners thanks to their top coffee puns and amazing photographs! It was so lovely hanging out and chatting with the NEbloggers- I really do like them, they're such a funny and warm bunch. I was chatting quite a bit with Rachael from GirlAboutTyne.com, it's always nice to hear a familiar accent and I guess with Northern Irish people there is a shared sense of humour because I really enjoyed how easy it was hanging out with her. The more we talked the more we realised we had in common- I'm from a small town on the North Coast of NI called Portrush and basically nobody has ever head of it but it turns out she has a lot of family there! EVEN WEIRDER is that as we talked it slowly dawned on us that her uncle is my neighbour. Like genuinely lives across the street from my mum & dad's house. Honestly what a small world. We were also the only two cheeky people to buy extra wine and were the last two to leave. Those damn Irish girls eh? Not really doing a lot for the stereotype, sigh. It was SUCH a lovely evening and really nice to meet new people as well as see some of the girls I had met at the craft event I went to. I can't wait for more events in the North East so I can hang out with these lovely people again. If you want to see more of what we got up to just check out the #coffeewithcurrys hastag on Twitter & Instagram, or you can read all about it on the Currys Blog post! Thanks so much to Joe Blogs & Revolution Bars for getting us together and a huge, huge thanks to Currys for hosting the event and supplying the winners with such amazing prizes! Cheers!